How is the BLOSSOM album different from CHOICE OF LIFE? What ideas did you all talk about before you started writing the new songs? Atsushi: We didn’t really talk about it, honestly. The sound of this new album came together naturally, I guess. KA+U: Yeah, it went pretty smoothly. Hiroko: I didn’t really think about changing, but I hoped to better express what I experienced. So I put a higher value on the lyrics and melodies this time around. TOMOYA: If I had to pick out a difference between BLOSSOM and CHOICE OF LIFE, I’d say the previous album had a lot of energy overall, but this [new] album was put together nicely with riffs that match the melodies, as Hiroko says. Please explain the meaning of BLOSSOM’s cover image. KA+U: This is for Hiroko-san! Hiroko: Yes. This [idea] is mine. (laughs) The theme is “love.” The rose is a woman, and the honeybee is a man. It’s a relationship. To know your own existence and the meaning of that existence, and to love someone and to be loved. There are many songs on this album with that theme, and the album jacket is the image of that kind of love. Why did you choose “NAKED” for the first single? What do you want a new fan to feel about RAMPANT when they hear that song? TOMOYA: Right! Don’t give up! KA+U: I hope this will be an uplifting song for everyone. 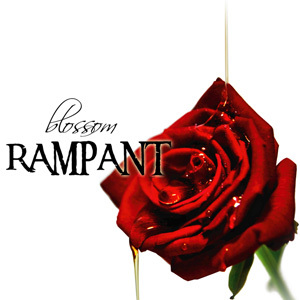 RAMPANT is an Osaka band. Do you feel that you have a different style than rock bands from Tokyo? Atsushi: I’ll pick one — the Osaka dialect! “WHITE FLOWER” is RAMPANT’s longest song to date (clocking in at exactly 6 minutes). It has a complex structure and is more quiet than your usual work. What was the inspiration for this song? KA+U: I don’t think it’s complex. It’s rather simple and easy! (laughs) I can’t make something complex! Hiroko: There’s a long road I’ve walked on for many years, and I wrote this song while remembering the snow we get every year, thinking about that image. It’s a memory. What’s your rehearsal dynamic like? What do you bring out in each other that fans can see on stage? TOMOYA: It’s my style to play to the maximum level, whether it’s a ballad or a hard-rock song. It’s always intense, no matter what. Atsushi: I see a message in the songs. For me, I play “NAKED” with a “Do your best!” message, and I play “WHITE FLOWER” with a “Reach for your dream!” message. KA+U: I value the mixture of sounds, and for me the bass is naturally important — so I think about how we can work all of these musical aspect together into a solid groove. I think we all listen to each other carefully when we practice. Kei: Me, too. I pay a lot of attention to KA+U’s drumming, and I focus on the kick-drum, on the overall rhythm. This might sound technical, and maybe not so much fun, but it’s an important thing. This will lead to good music. Do you plan to release “NEW BORN” on a future album? KA+U: I think about it, of course, but not now… There’s an energy that can only be delivered live. Atsushi: Right, it has an feeling that can’t be expressed on CD. TOMOYA: I agree with what they said, but I’m hoping that we can release it somehow in the future. We’ll figure out a way. RAMPANT always seems to have a busy schedule. What things do you guys do to recharge? Hiroko: For me, I like relaxing at a quiet cafe, or playing with my dog, Charlie, as much as I want! KA+U: I like to do a lot of physical training. I love working out whenever I can. Kei: If I have time, I like to go for a drive. Atsushi: I like to take walks. TOMOYA: I like movies, so I go to the movies a lot. Oh, and recently, I’ve got a new thing – tennis! What’s your goal right now? What’s waiting for you in the future? Hiroko: I want to sing in front of as many fans as possible. This hasn’t changed from the beginning. KA+U: Right. I think that’s the same for all of us, whether it’s in Osaka or anywhere else. TOMOYA: It’s not a large country, so we can perform nationally. We try to go everywhere we can. Hiroko: Even if there was just one goal — and even if I found a way to reach that goal — the start of something new would be waiting for me right there, and then I’d start again.